Social networking has changed the way we communicate, do business, get our daily news fix and so much more. But is it really all it's cracked up to be? That depends on who you talk to and how you're using it. A site like Facebook could serve as an opportunistic launching pad for a new business owner, or it could be an inescapable source of negative peer pressure for a young teen. There are pros and cons to everything in life — and that includes our social networking habits. Here are some of the major pros and cons that most people are familiar with. As you go through them, ask yourself how you can take more advantage of the pros while minimizing the cons whenever you decide to check out your favorite social networks. Ability to connect to other people all over the world. One of the most obvious pros of using social networks is the ability to instantly reach people from anywhere. Use Facebook to stay in touch with your old high school friends who've relocated all over the country, get on Google Hangouts with relatives who live halfway around the world, or meet brand new people on Twitter from cities or regions you've never even heard of before. Easy and instant communication. Now that we're connected wherever we go, we don't have to rely on our landlines, answering machines or snail mail to contact somebody. We can simply open up our laptops or pick up our smartphones and immediately start communicating with anyone on platforms like Twitter or one of the many social messaging apps available. Real-time news and information discovery. Gone are the days of waiting around for the six o'clock news to come on TV or for the delivery boy to bring the newspaper in the morning. If you want to know what's going on in the world, all you need to do is jump on social media. An added bonus is that you can customize your news and information discovery experiences by choosing to follow exactly what you want. Great opportunities for business owners. Business owners and other types of professional organizations can connect with current customers, sell their products and expand their reach using social media. There are actually lots of entrepreneurs and businesses out there that thrive almost entirely on social networks and wouldn't even be able to operate without it. General fun and enjoyment. You have to admit that social networking is just plain fun sometimes. A lot of people turn to it when they catch a break at work or just want to relax at home. Since people are naturally social creatures, it's often quite satisfying to see comments and likes show up on our own posts, and it's convenient to be able to see exactly what our friends are up to without having to ask them directly. Information overwhelm. With so many people now on social media tweeting links and posting selfies and sharing YouTube videos, it sure can get pretty noisy. Becoming overwhelmed by too many Facebook friends to keep up with or too many Instagram photos to browse through isn't all that uncommon. Over time, we tend to rack up a lot of friends and followers, and that can lead to lots of bloated news feeds with too much content we're not all that interested in. Privacy issues. With so much sharing going on, issues over privacy will always be a big concern. Whether it's a question of social sites owning your content after it's posted, becoming a target after sharing your geographical location online, or even getting in trouble at work after tweeting something inappropriate — sharing too much with the public can open up all sorts of problems that sometimes can't ever be undone. Social peer pressure and cyber bullying. For people struggling to fit in with their peers — especially teens and young adults — the pressure to do certain things or act a certain way can be even worse on social media than it is at school or any other offline setting. In some extreme cases, the overwhelming pressure to fit in with everyone posting on social media or becoming the target of a cyberbullying attack can lead to serious stress, anxiety and even depression. Online interaction substitution for offline interaction. Since people are now connected all the time and you can pull up a friend's social profile with a click of your mouse or a tap of your smartphone, it's a lot easier to use online interaction as a substitute for face-to-face interaction. Some people argue that social media actually promotes antisocial human behavior. Distraction and procrastination. How often do you see someone look at their phone? People get distracted by all the social apps and news and messages they receive, leading to all sorts of problems like distracted driving or the lack of gaining someone's full attention during a conversation. Browsing social media can also feed procrastination habits and become something people turn to in order to avoid certain tasks or responsibilities. 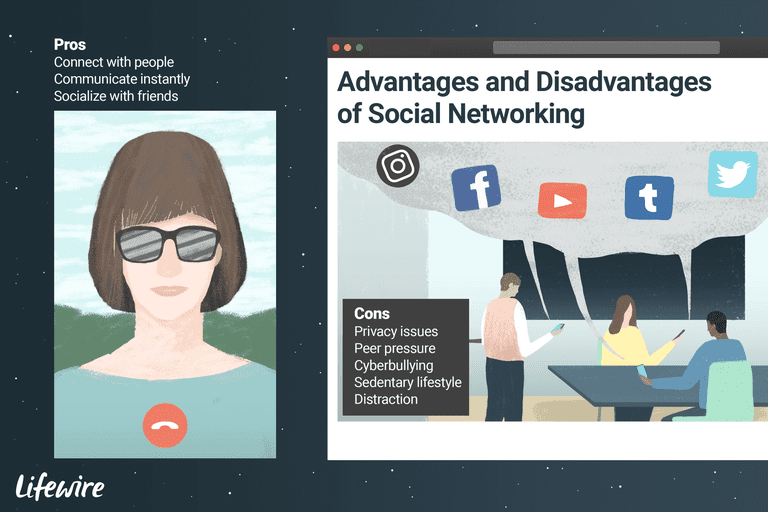 Focus on using social media for all the good points outlined in this article, but be wary of falling victim to the dark side of an online interaction. Check out this list of social networking sites to see which ones are the most popular right now. What Are the Pros and Cons of Mobile Marketing?